Our flexible air cells (also called rubber bags or bladders for conservators) are dedicated to compensate oil volume variations (conservator compensator) while temperature is changing. This kind of air bags avoid condensation. Thanks to our skills and equipments, sized and shapes can be adapted to all conservator types, for all electrical transformers. Well developed and adapted to your requirements, oil will never meet to avoid oil contamination. Oil will always be protected from nitrogen and atmospheric agents including ozone. Made out of elastomer coated fabric and vulcanized at high temperature under vacuum, they will insure very high external resistance. RELIABILITY: No contact between oil & air : no oil pollution, no condensation, no oxidation, no hydrolysis. 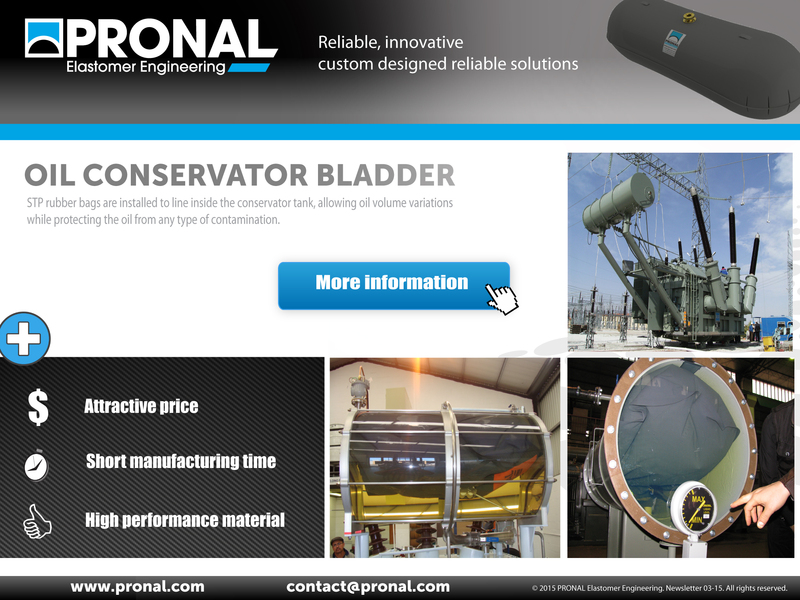 To receive our newsletters : contact@pronal.com CONTACT US !